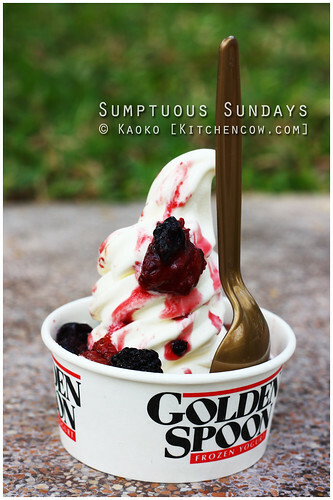 Welcome to Kitchen Cow’s first Sumptuous Sunday. Starting this Sunday, I’ll start a series of photo only posts. Well, a photo / photo series with a few descriptions. No reviews, no passing judgement. Just food–glorious food. Why do a photo only post series? Because I am the queen of backlogs and my folder of unwritten features is starting to take on a life of its own. Before they get all mutinous on me, I might as well post them. Truthfully, I doubt if I’ll ever get to write about these photos so instead of letting them go to waste, I’ll just share them, as is. Besides, do you guys really stop to read long posts on Sundays? I rest my case. This is actually one of my favorite yogurt shops. I’m not into toppings much so I appreciate the different flavors. I’m not big on toppings too. The ones I pick are mainly there for texture. My standby’s White Hat Homemade Granola and Almonds. YUM! my fave froyo place is redmango! with their greentea base! mmmmm! I love yogurt. This one looks yummy. A perfect alternative to ice cream. I haven’t tried redmango pero friends keep telling me to try it nga. Will do next time I’m at Greenbelt.